Extended MQSC (MQSCX) is a program which performs a similar function to the RUNMQSC program but improves on its usability, particularly when used in interactive mode. Many of the frustrating elements of RUNMQSC have been removed and entering MQSC commands is made faster, easier and less error prone. It also provides a powerful command language, including functions, making writing dynamic scripts and reports simplicity itself. Built-in debugger for those complicated scripts! Fully configurable appearance, change columns, colours, separators, etc. MQSCX runs on a variety of platforms and can be used to administer all versions of IBM® MQ which are in support and which provide PCF and MQSC interfaces. In particular this includes the z/OS platform including Queue Sharing Group (QSG) installations. You can watch videos which introduce some aspects of MQSCX here. You can read blog posts on MQSCX here. We are interested in your comments and suggestions for future videos and posts. 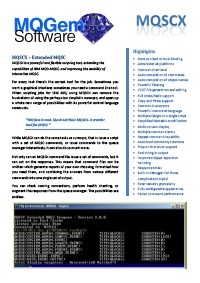 The MQSCX program can be downloaded for free. However, to run the program and issue commands you will need to purchase a licence. Please go to the download page here. A licence file can be purchased by following the link below. Alternatively you can send an email to MQGem support and you will be sent a trial licence valid for one month. It is recommended that before purchasing an MQSCX license you download and run the MQSCX program to ensure that it runs correctly on your platform and is able to connect to your Queue Managers. The Help screen in the MQSCX program will also contain the User Id and Machine Name information you will need when buying any license other than a Diamond license. To purchase a licence file for the MQSCX program please go to the purchase page here.